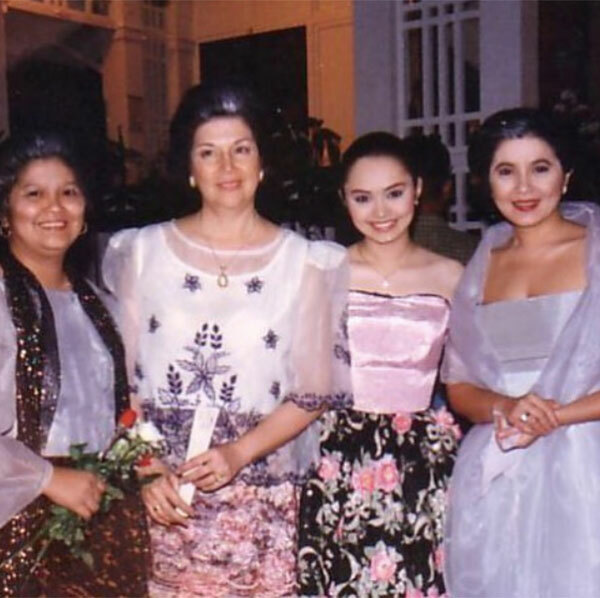 (L-R) Angelu de Leon, Angelika dela Cruz, and Sunshine Dizon are three of the original Kapuso stars who top-billed successful teleseryes in GMA-7. 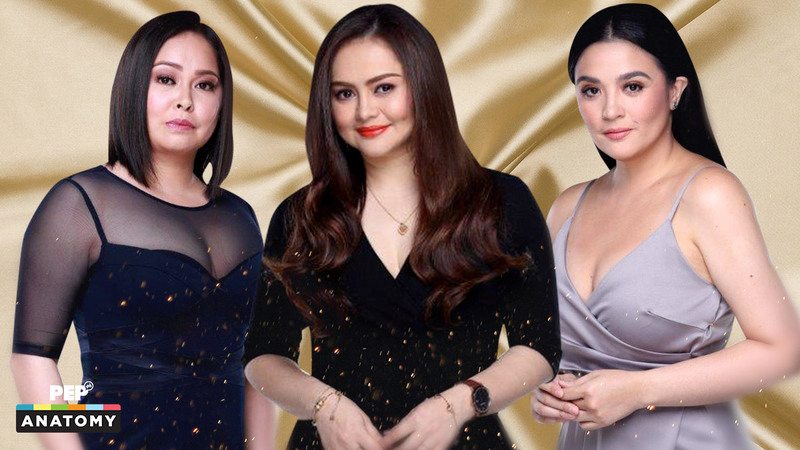 GMA-7 stars Sunshine Dizon, Angelu de Leon, and Angelika dela Cruz are considered three of the original drama leading ladies of Kapuso teleseryes. These stars are also considered to be among the loyal stars who have spent the longest time working with the Kapuso Network. They were able to do various teleseryes as Kapuso stars, with the chance to be given different types of roles as either the bida or kontrabida. In the third part of ANATOMY OF A PINOY TELESERYE: FROM THE POINT OF VIEW OF GMA-7 ACTRESSES, Sunshine, Angelu, and Angelika recall their notable experiences in their careers as teleserye stars, and why they remained loyal Kapuso talents. They also tackled their transition from doing lead to supporting roles in other shows, and their perspectives regarding longevity and staying power in showbiz. Sunshine has been in showbiz the longest, starting her career in 1986 as a child actress. When she ventured into TV acting, Sunshine has been loyal to the Kapuso Network since 1996. But there was a point in her career when she took a hiatus and almost did not return to showbiz. This was in 2010, when she got married and built her own family. She recalls, "Ako, parang four years akong di nagtrabaho, e, when I got married and I got pregnant. Parang, I wasn't really sure if I wanted to come back. "Well, every year naman, they would call. But, I would have my excuses na, 'Hindi ko pa keri, mataba pa ako. "'Tapos biglang nabuntis naman ako ulit. So, may excuse na naman ako not to work. "So, finally, they called me, my very first show before I really came back was I did a story for Magpakailanman, yung tumalon sa train." This was in early 2013, when GMA-7 tapped Sunshine to top-bill the life story of Lucy Aroma, a woman who died when she jumped on the MRT railway tracks. It was Sunshine's first acting stint after a four-year hiatus. Sunshine continues, "I remember doing that thinking na parang okay lang, it's just another work day and if I decide not to come back, I'm gonna be able to say no. "E, noong nagte-taping... two days taping yun, e. Hindi pa ko umuwi kasi sa Pampanga ako nakatira, e, tapos magkasunod na araw yung taping, first time kong di umuwi." Sunshine was shocked when GMA-7 started promoting her Magpakailanman episode as her big showbiz comeback. Given that she had a different intention for the project, Sunshine cried and expressed her worries to Mona Coles-Mayuga, the executive producer of Magpakailanman at that time. Prior to this MPK stint, they worked with each other in Encantadia. "I was crying, I was crying to Miss Mona. Hindi ko in-expect. That was not the illusion in my head, e.
"E, ganun yung nilabas! Bigla kong na-realize yung truth na this is make or break! "If this doesn't rate well, it's the end of me. Wala na akong choice to say no. Parang hindi ako prepared for that foreseeable future. "I was talking to Miss Mona, I was like, 'Nay, bakit ganun?' Tapos iyak ako nang iyak. "Hindi ako prepared. 'Paano kung hindi ito mag-rate, paano kung ganyan?' Kumbaga, the truth suddenly hit me. "Sabi ni Miss Mo sa akin, 'Bakit ka umiiyak? You can only do so much. As long as you know you've given all you can and you did your best, if it works then it works. "'Then, if it doesn't work, you have your closure, pwede ka nang manahimik. Huwag ka nang bumalik, masaya ka naman sa buhay mo,' sabi ni nanay sa akin." After it aired, Sunshine was relieved that the MPK episode rated well. 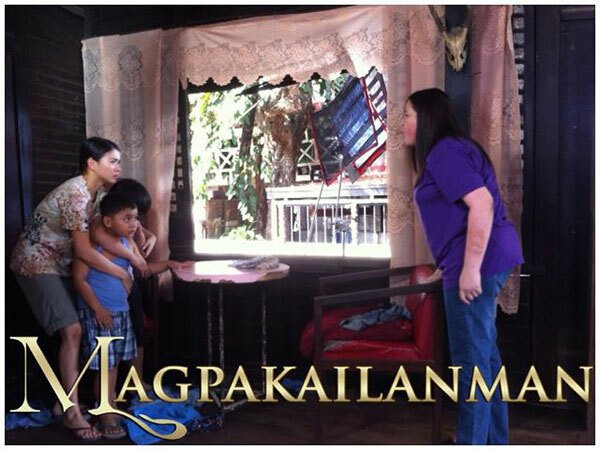 According to TV ratings provider AGB Nielsen, Sunshine's Magpakailanman episode got a Mega Manila TV rating of 25.7%. Sunshine's ratings figure is 3.6% higher compared to ABS-CBN rival program MMK's 22.1%. She says about this, "Thank God, thank God, mataas naman, tinalo ko naman 'ata yung kabila, maganda naman yung rating. "And then, after that, sabi ko, safe zone ako." After her Magpakailanman episode, Sunshine got an offer for an acting comeback from a rival network. She said, "'Tapos, nagka-offer ako, actually, sa Channel 5, to do something. "Pero sila Kuya RJ, ayan na naman ang mga kaibigan. Tumawag for Mundo Mo'y Akin." RJ Nuevas, a creative head in GMA-7 dramas, offered Sunshine the role of Perlita in the then-upcoming series, Mundo Mo'y Akin. He told her back then: "You have to do this. 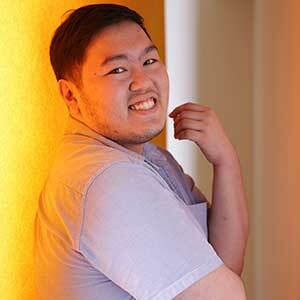 There's no one..."
Sunshine reasoned out, "Kuya Arj, ang taba ko," but RJ answered, "Ay, perfect ka ngayon." She recalls, "Alam mo, ang nakakatawa with me, akala ng mga tao, kapag medyo malaki ako, parang nagpeprepare ako for something, pero nagkakataon lang yun. "Parang with Bakekang, payat ako, 'tapos halfway, tumaba din ako, pasok siya lagi sa story. "Tapos, nakakapag-prepare naman ako, pumapayat naman ulit ako for the next show coming. "So, akala nila, parang sadya. Hindi totoo 'yon! Nagkakataon lang talaga, kaya ang laki-laki ko sa Mundo Mo'y Akin. "Tapos bigla kong naisip, I said no already to Bakekang, I don't want to do it anymore because of all the prosthetics, ang hirap! The nose, the teeth. "I don't know, but I said yes, and then halfway, I was saying, 'Why am I doing this again?!'" At present, Sunshine still has an existing network contract with GMA-7. Since her comeback, she has been able to do eight teleseryes. 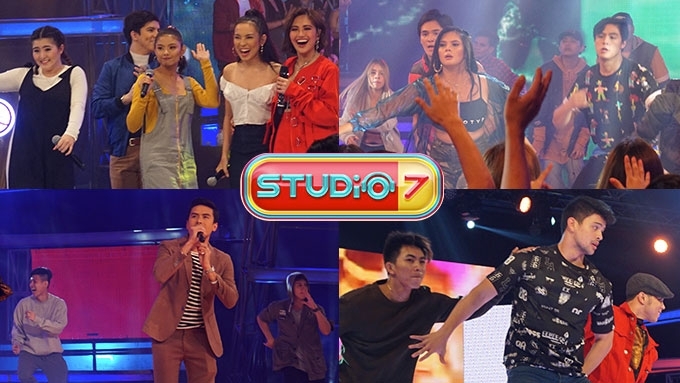 This includes the top-rating afternoon series, Ika-6 Na Utos, which became a certified hit for its campy yet entertaing fight scenes that went viral on social media. With its high ratings and social media impact, the show that was originally intended for a six-week run was extended to one year and three months. It aired from December 2016 to March 2018. Before becoming a Kapuso, Angelu began her career in ABS-CBN, via Ang TV, in 1994. A year later, in 1995, she signed up with VIVA Artists Agency, where she was assigned to top-bill shows in GMA-7, and was given a big break as an actress. Now a freelance actress, Angelu remains grateful to both networks. "I've always been grateful. I always look back and say, I was with ABS for a year when I started and I'm grateful for that. Kumbaga, doon ako nakilala. "Pero kung saan ako tumira, it is really GMA. "Kung saan ako nagkabahay, where I had a home, talagang sa GMA." Still, she would get offers from ABS-CBN. In fact, she revealed in a 2017 interview with PEP.ph that she got an offer to appear in FPJ's Ang Probinsyano. The TGIS star explains, "Laging nakakatuwa kasi laging kapag nagkakasabay ng offer, laging GMA ang nauuna. "And by respect, they never failed me by giving... work is work. Parang sa akin, lagi kong sasabihin, work is worship. I'm always grateful for work. "So, noong time na yun, laging ganon, laging nasa isip nila ako. "So, why take that for granted? For what: for money? For exposure? "Minsan, parang sasabihin mo, money is not really the issue. Sometimes, you have to look at what they're giving you—the time, the effort, pinag-isipan ka rin, yun yung always na ipagpapasalamat ko." It was also GMA-7 that gave Angelu another chance in her acting career. In 1998, as discussed in the first part of this special report, Angelu had to leave GMA-7 and VIVA Television's series, Growing Up, because of her untimely pregnancy. At that time, she became pregnant with her child with Joko Diaz. In 2000, Angelu was able to stage a comeback via VIVA TV's drama series, May Bukas Pa, that aired in IBC-13. She also top-billed the movie, Bulaklak ng Maynila. 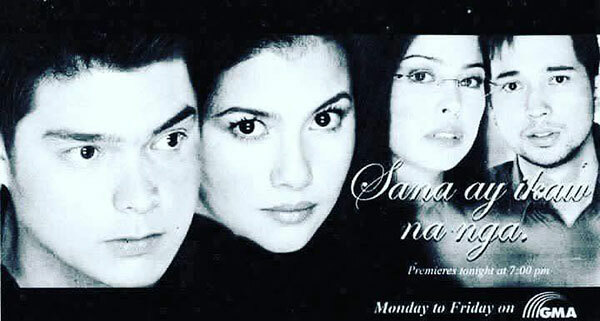 In 2001, Angelu returned to GMA-7 via a supporting but major role in the prime-time series, Sana Ay Ikaw Na Nga. The show top-billed by Tanya Garcia and Dingdong Dantes featured Angelu and her TGIS partner, Bobby Andrews, in the second lead roles. Back then, was Angelu frustrated that she was only given a supporting role for her comeback show in GMA-7? She answers, "Alam mo, di ko naisip. "Kasi, noong time nga na mag-comeback ako, hindi ko alam kung may tatanggap pa, e.
"You'll face that reality kasi iba yung sitwasyon namin ni Sunshine, e.
"Parang yung feeling na grateful ka na lang magkawork, kasi, you will do what you really love to do. "It's not... actually, hindi ko na nga naisip na, 'Gusto ko sisikat ako!' Alam mo yung ganun? Wala nang ganun." Sunshine adds, "Ako, I understand what Ate Anj is saying, kasi parang ako rin, after nga noong Mundo Mo'y Akin, nagsunud-sunod yun, e.
"And then, especially with Ika-6 Na Utos, that's really a dark horse. "I mean, to be honest, I'm happy that I'm just able to work. I'm very grateful na parang may anak na ako, nagka-asawa na ako and all." Sunshine is also proud to say that she, Angelu, and Angelika were able to survive this long in show business even though they aren't playing the lead roles anymore in most of their teleseryes. The Ika-6 Na Utos star explains, "I think, it's good for us na we're not stuck. "Kasi, may ibang ganon, e, na nasa-stuck sila sa era nila na feeling nila, they're still that somebody or whatever! "Alam mo yung ganun? May mga taong ganun, nasa-stuck sila do'n." Angelu, being a popular teen actress in her heydays, says she is just more than happy to see the new batch of teen superstars loving and enjoying their craft. "Siguro kasi, we're grateful, because kung ano man yung nakikita nila sa mga baguhan ngayon na sila yung sikat, once in our lifetime, we felt that. "So, walang inggit, kasi we know the feeling. "Kaya nga minsan, masasabi na nga lang namin, 'Pangalagaan niyo 'yan. Always be grateful, always be professional.'" As for Angelika, she has not headlined a solo project since she returned to ABS-CBN in 2004. In her first project for her Kapamilya comeback, she was included in the cast of Sana'y Wala Nang Wakas, starring Jericho Rosales and Kristine Hermosa. Her character wasn't exactly central to the story, but she was one of the major characters. In 2005, Angelika also played a major character in the teleserye Ikaw Ang Lahat Sa Akin, starring Claudine Barretto, Bea Alonzo, John Lloyd Cruz, Shaina Magdayao, and Diether Ocampo. Recalling the series, Angelika says, "Maganda yung show na yun. Yung last scene namin, kinakasal kami ni Diether sa kulungan, e."
In 2006, Angelika accepted a kontrabida role for the first time via ABS-CBN's remake of Bituing Walang Ningning. She was cast as Lavinia Arguelles, the role first made iconic by Cherie Gil. This character uttered the iconic line, "You're nothing, but a second-rate, trying hard copycat!" 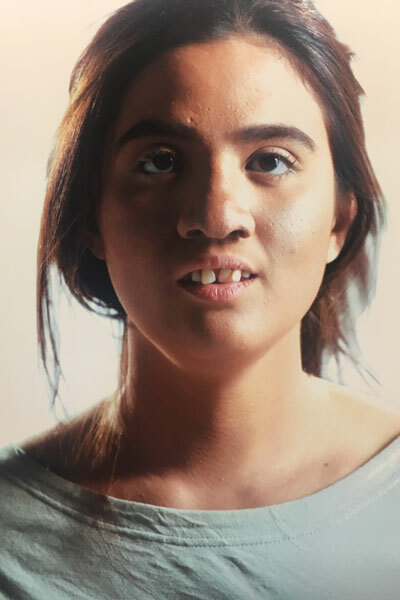 Looking back, Angelika says, "Yes, yun ang kauna-unahang kontrabida role ko, 'tapos ang swerte ko pa, kasi Lavinia Arguelles yung role na na-play ko. "Ang ganda nung pagkakagawa ng soap, at saka top-rating yung show." Looking back, Angelika admits that she thought long and hard if would accept the kontrabida role. She reveals, "Bago ko ginawa 'yon, pinag-isipan ko talaga, e, kung what do I want to be. "Gusto ko bang yung maging character actress na hindi lang nakakahon yung role na ipo-portray ko? Pinag-isipan ko siya, e."
In the end, she realized that Lavinia Arguelles is the perfect vehicle to show that she is willing to take risks. "Kaya ready ako. Ready ako. Kasi kung hindi ako ready, hindi ko gagawin yun, e.
"Kahit pilitin ako? Ang isasagot ko lang do'n, hindi ako ready." After Bituing Walang Ningning, Angelika became the kontrabida in her succeeding shows, especially when she transferred to GMA-7 in 2008. She might not be headlining her own shows anymore, but she is still tapped to play main characters. There are also times when she is cast as the mother of the lead actress. Despite being one of GMA-7's original drama princesses, Angelika believes that playing a supporting role is not a big deal. She says about this, "Pareho lang sa akin, e. Kasi ever since naman kasi, sa akin, it's work. "At saka as long as natsa-challenge ako, okay ako doon, e. Ayoko kapag hindi challenging, e.
"Kahit bigyan mo ako ng lead role, tapos hindi challenging? Gagawin ko, siyempre, trabaho yun, e.
"Pero yung fulfillment, kulang, e. Gusto ko yung may challenge, yung talagang kapag halimbawa, nakita ako ng mga tao sa labas, 'Ang galing mo doon sa ganun!' Yung ganun. "Gusto ko yung nararamdaman nila yung character ko, yung feeling nila, totoo yung character na ginagampanan ko." She also considers playing a kontrabida as more challenging. Angelika reasons out, "Masarap kasing lagyan ng layers yung character pag kontrabida ka, lalo na pag yung kontrabida, may puso. "Okay ako magkontrabida, pero mas gusto ko yung kontrabida na yung normal pa rin na tao, kasi wala namang taong masama lang, e.
"Pwera na lang kung psycho ka, pero yung talagang masama lang? Lahat ng masamang tao, may kabutihan, lahat ng masamang tao, may taong mahal. Para sa akin, walang black lang. "Kasi yun yung normal, e. Yun yung totoo, e. Mas maganda kasi talaga yung realistic, e. E, kasi imposible, e. Lahat ng tao, may pinaghuhugutan, ganun." Angelika started her career with ABS-CBN in 1996. In 1999, she transferred to GMA-7, as part of the Jessa Zaragoza-starrer, Di Ba’t Ikaw. In December 1999, Angelika played a major character in the GMA-7 mini-series Liwanag ng Hatinggabi, as Lorna Tolentino's daughter. In June 2000, Angelika was given a big break in her career via the Kapuso mini-series, Umulan Man O Umaraw. This was followed by several lead roles where she played "inaapi" roles. In 2003, however, Angelika decided to return to ABS-CBN. The Kapamilya Network gave her the Lavinia Arguelles kontrabida role in the 2006 TV adaptation of Bituing Walang Ningning. Before she returned in GMA-7 in 2008, there were projects that she was supposed to do with ABS-CBN. Angelika was supposed to play the leading lady of Vhong Navarro in the 2007 TV adaptation of Lastikman, but she was replaced by Iya Villania due to scheduling problems. Angelika was also considered for the role of Desiree del Valle in Judy Ann Santos's 2007 drama series, Ysabella. Angelika turned down the role she had just finished playing a villain in Bituing Walang Ningning. Talking about lost roles, Angelika says, "Parang normal naman yun, lahat naman ng artista dumadaan do'n. "Kailangan, marunong kang mag-move on. Hindi puwedeng naka-stuck ka lang. This is work, e.
"Kapag masyado kang naglagay ng emosyon dito, kawawa ka, kasi trabaho ito, e. Kailangan professional ka, alam mo kung hanggang saan yung line na, 'hanggang dito lang ako.'" Angelika says she does not feel frustrated when it comes to shelved projects. In 2007, it was reported that Angelika was supposed to play the lead role in the remake of Vilma Santos's 1990 movie, Kapag Langit Ang Humatol. This was supposed to be part of ABS-CBN's SineSerye umbrella series. Maja Salvador, who is only six years younger than her, was supposed to play her daughter. Eventually, the project was shelved. When PEP.ph brought this up during the interview, Angelika couldn't remember the project anymore. However, she points out, "Marami namang ganun, e. Hindi kasi ako nag-e-expect. "Hangga't hindi ko ginagawa, hindi ko kinu-consider na akin ito, e.
"Kasi dito, minsan, may last minute na papalitan ka. Nangyayari talaga yun, e."
This also happened to her younger sister, Mika dela Cruz, who was supposed to top-bill a show in GMA-7 after she transferred in late 2016. However, the project did not push through. Months later, Mika top-billed GMA-7's prime-time series, Kara Mia, alongside Barbie Forteza. Angelika points out, "Nangyari rin 'yan kay Mika. Dapat meron siyang show, pero hindi napunta sa kanya. May reason for that. "So, ito naman yung show niya, ito yung para sa kanya. Kasi chemistry 'yan, e. Mas may chemistry sila ni Barbie. Kaya ito yung para sa kanya. "Ganun yun, e. Kaya lang kasi, kapag ikaw kasi, masyado kang emosyonal, hindi mo maiisip yung mga ganung bagay. "Maano mo, 'Bakit ako tinanggal? Bakit ako ginanun? Bakit ako naitsapwera?' You can't be like that. "Kailangan, maiisip mo, 'Ah, kaya ako di napunta dito kasi nga naman di kami bagay ni ganito. Ah, ganyan kasi.'" Angelika says that ever since she started in show business, she already has this mindset, although she also had her fair share of temperamental days when she was younger. "Kailangan ganun, e. Mas bugnutin lang ako noong bagets ako, dahil nga bagets ka. "Siyempre, di ba, kulang pa yung understanding mo, e.
"Pero oo, ganun naman lagi yung perspective ko, e. Hindi ako yung... di ba, yung iba kasi, meron na parang 'Oh, kakanta tayo, kailangan ako yung huli, kailangan ako yung ganun.' Never, e.
"Hindi ako ganun. Kapag binigay sa akin okay, pag hindi, hindi rin, bahala kayo." Sunshine believes that in showbiz, having longevity and a passionate mindset is more important than popularity and fortune. She keeps in mind what she learned from the late Fernando Poe Jr. They became close after working with each other during Sunshine's child star days. She says, "I believe naman sa showbiz talaga, umiikot lang naman talaga, e. It's really your staying power. "You know when you hit the top, there's nowhere else to go but to go down." Sunshine started realizing this when she was under the management of Veana Flores, who also used to manage Angelu's career. She recalls telling her former manager, "Ang sabi ko talaga kay Tita Veans, it's not my dream to be a superstar. My only dream was to be an actress. I want to act. That's my passion." In the first part of this special report, it was discussed that Sunshine was pulled out of the GMA-7 drama series, Ikaw Lang Ang Mamahalin, in 2001. Reports back then said that the reason behind this was Sunshine's rift with co-star, Angelika dela Cruz. They both admitted that they had a rift back then. However, the real reason why Sunshine's character was killed off in the show was because she was pulled out by her manager who doesn't want her to play a kontrabida role. "Honestly, fame is just a bonus for me. "Mine is, I want to work, I need to work, kailangan ko yung pera. Aminin na natin, ngayong may pamilya na." Angelu adds, "Ngayon na lang yun. Noon talaga, gusto ko lang umacting." Sunshine continues, "Oo, you're just very passionate of what you're doing. "So, siguro, I think, doon mo makikita, e, kung sino yung mga naiiwan at sino yung nawawala na rin. "Kasi ang mindset, hindi naman talaga yung craft, e. Iba yung passion nila. "Kapag kumita ka na ng pera, magsasawa ka na, di ba? "Kasi na-achieve mo na yung dream mo, nabilhan mo na ng bahay yung magulang mo. "Hindi yung, 'Gusto ko lang kumita,' or what. "Makikita mo yun from the new ones to the likes of Tita Gloria Romero, di ba? Passion yun." The veteran actress has been acting in the showbiz industry since 1951. 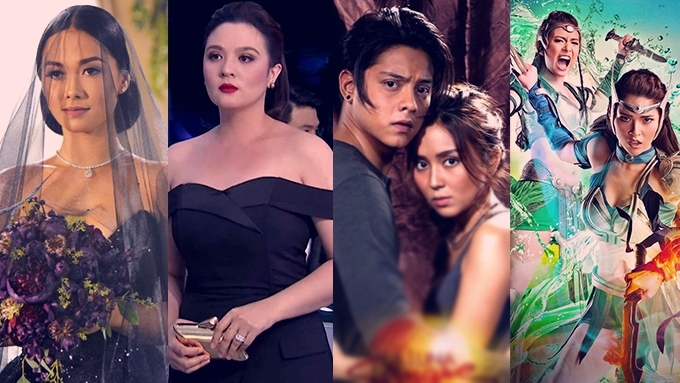 PART 1: ANATOMY OF A PINOY TELESERYE: How do ABS-CBN and GMA-7 produce their teleseryes?